There are times when you need to transfer data from one computer to the other, but you are in a fix about how to go about the process. EaseUS Free PC transfer software will help you in transferring even the applications and setting from one place to the other without any complications. You can also transfer the data from older version to the newer version of the OS, if you wish to do so quite comfortably. Your pictures and music along with other documents can be easily transferred to the new PC or the new Operating System. It is highly reliable and completely secured; therefore, there is no need to be scared of any kinds of issues. Moreover, your old PC will remain intact and if you are worried that your new PC might get affected, then you don’t need to worry at all because the software takes care of everything all by itself. It is intuitive and quite easy to use and the good news is that you don’t need to be a tech geek to make this work. Even the commercial information can also be transferred with the help of this software. It supports Windows Server 2008, 2003 as well as 2012. 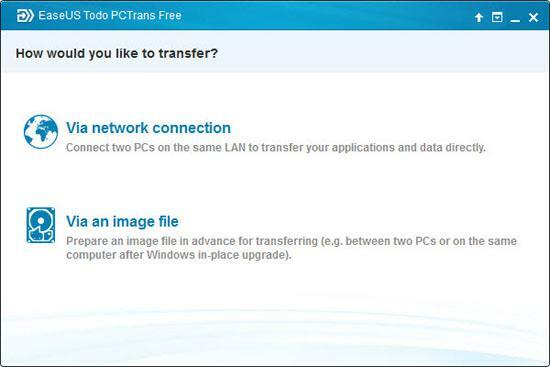 It enables you to transfer the data as well as applications from one computer to the other through an image file. In case, you are upgrading, then also you can make use of this software and transfer the applications through network connections too. You can either download EaseUS software for free trial or you can go for the Professional or Technician pack. In case of transferring of applications, in the free version you will be able to transfer only 2 of them, but the paid version will allow you unlimited transfer of applications. The tech support is available even for the free version and the operating system that it supports includes, Windows 7/ 8/ 8.1/ Vista and XP. If you feel that you are comfortable with the network connection, and then you can transfer the data through that else you can use image file and make the most out of this software. There is no two ways about the fact that the users are quite impressed with the way this software has been performing. It has helped them a lot in transferring the applications and settings from one PC to another without any hitches. There have been times when you loved the new upgrades of the Operating System that you have, but you are scared to take the plunge because there are applications and settings in the older version that is important for your work. EaseUS has worked like a bridge where it serves your purpose and transfers all that is important for you to the newer one with no major hiccups at all. You can be rest assured about one thing and that is your old or your new PC won’t be harmed at any cost.